I am absolutely thrilled to be posting the 15th edition of the MaiTai Collection in action collage today. I feel so honored to have received so many new and fabulous contributions during the past three months, and it fills me with tremendous pride and joy to see items of the collection worn so beautifully and with such creativity around the globe. Thank you so much for sharing your fabulous style, dearest Anne, Annie, Barb, Blighty, Cecilia, Carol, Carole, Christine, Colombina, East Side Pigeon, Faux Fuchsia, happyface, H.O, Irma, Jasmine, Jerrine, Johanna, Katja, KS, Macs in the City, Manuela, Maricar, Marla in the OC, Nadine, Paola, Perla, Preska, Tamara and wordlark, you are the best! Knot variations by KS with a 'Brides et Gris-Gris' 90 carré and a Grande Classique scarf ring in Mother of Pearl. Clockwise from top left: Waterfall knot (pic 1 and 2) and pleated bow knot (pic 3). 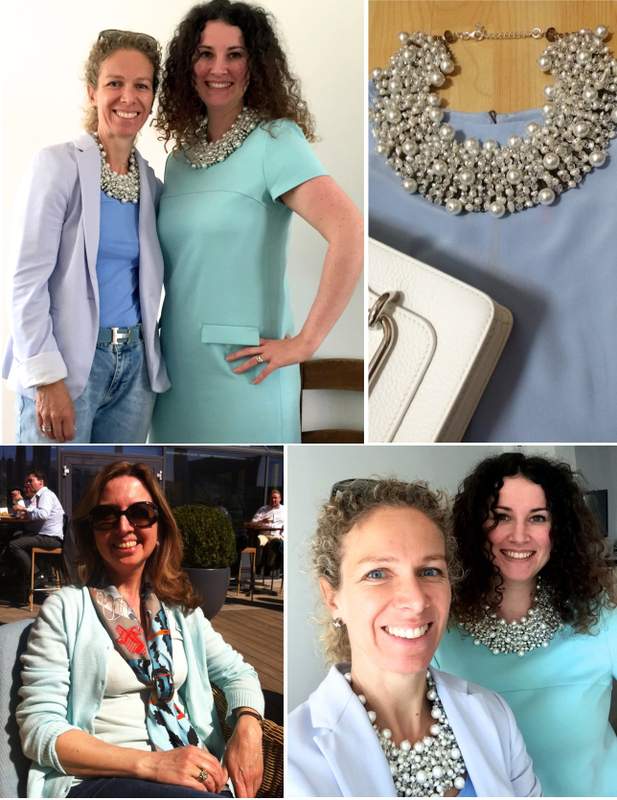 Clockwise from top left: Nadine (left) and Tamara (right) with Pearl statement necklaces in blanc/ivoire. Still-life by Jasmine with a Pearl statement necklaces in blanc/ivoire. Nadine and Tamara as before. Manuela with a 'Monsieur et Madame' 90 carré in a vertical basic slide, secured with a shawl ring in sunshine honey. Clockwise from left:Marla in the OC with a 'Paridaiza' 90 carré folded in the rectangle and secured with a lacquered Classique scarf ring in vert sapin in a criss-cross knot. Still-life with ribboned Classique scarf ring boxes by Barb. 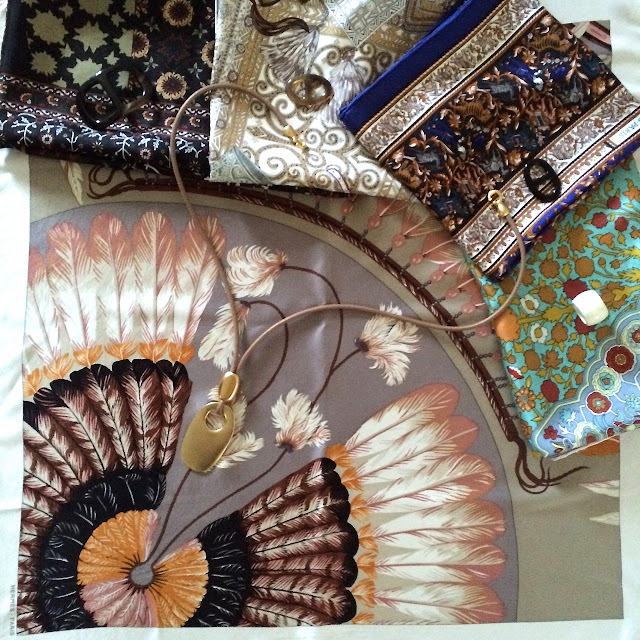 Still-life of a Toile de Jouy scarf travel pochette by Annie. 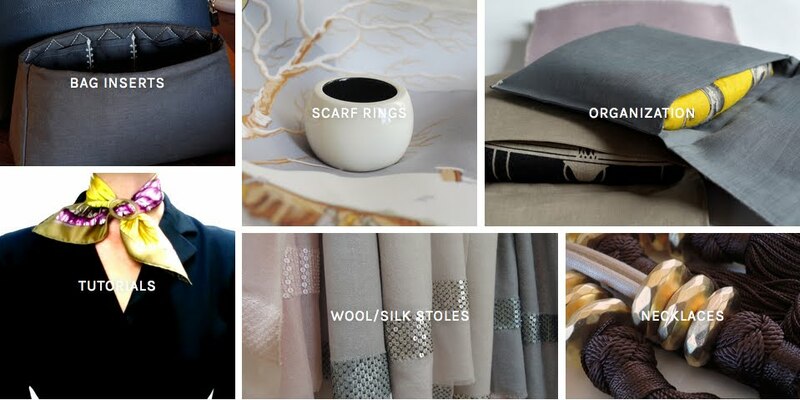 Clockwise from top left: Still-life by Maricar with lavender sachets in taupe/gris/rose/lilac. Carol with a pendant necklace in or. 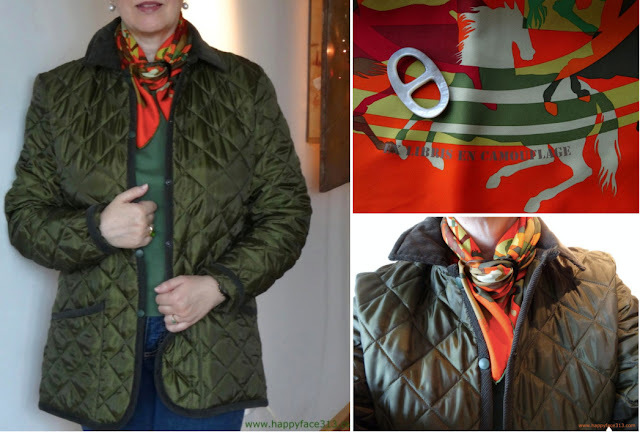 Kendal with a 'Zebra Pegasus' 90 carré tied with a criss-cross knot into a belt, end secured with a Moyenne Classique scarf ring in sunshine honey. Still-life by Katja with a pendant necklace in or, and (from left to right) a shawl ring in black with sunshine horn, Moyenne scarf rings in honey and black horn and a lacquered Anneau Infinity in ivoire. 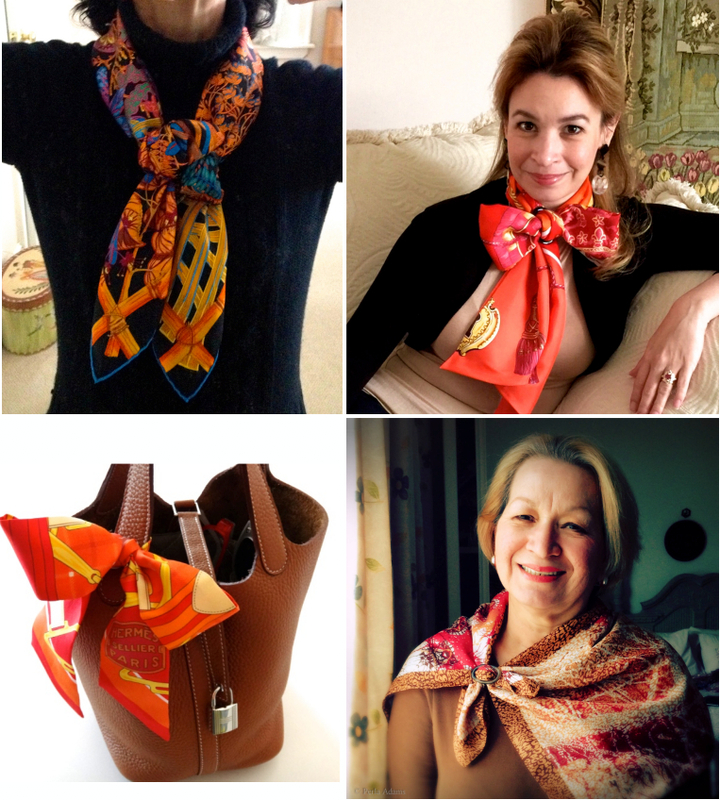 Clockwise from top left: H.O with a 'Brandebourgs' cashmere GM tied into a cowboy knot with a shawl ring in sunshine honey horn. Still-life with a pearl statement necklace by Jasmine. H.O. as before. 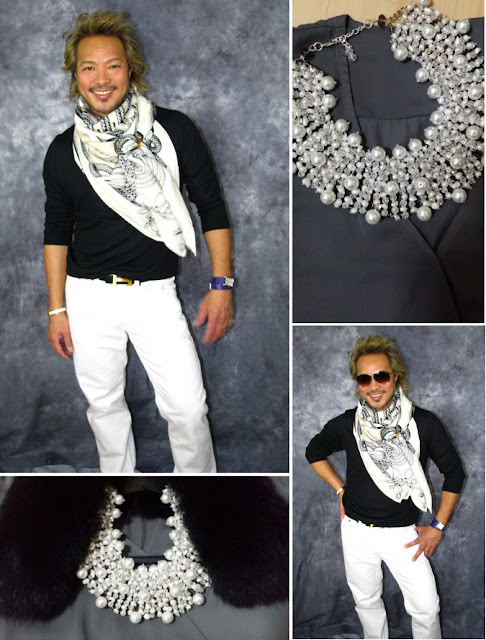 Still-life by Jasmine with a pearl statement necklace in blanc/ivoire and a SAGA fox fur collar in black. 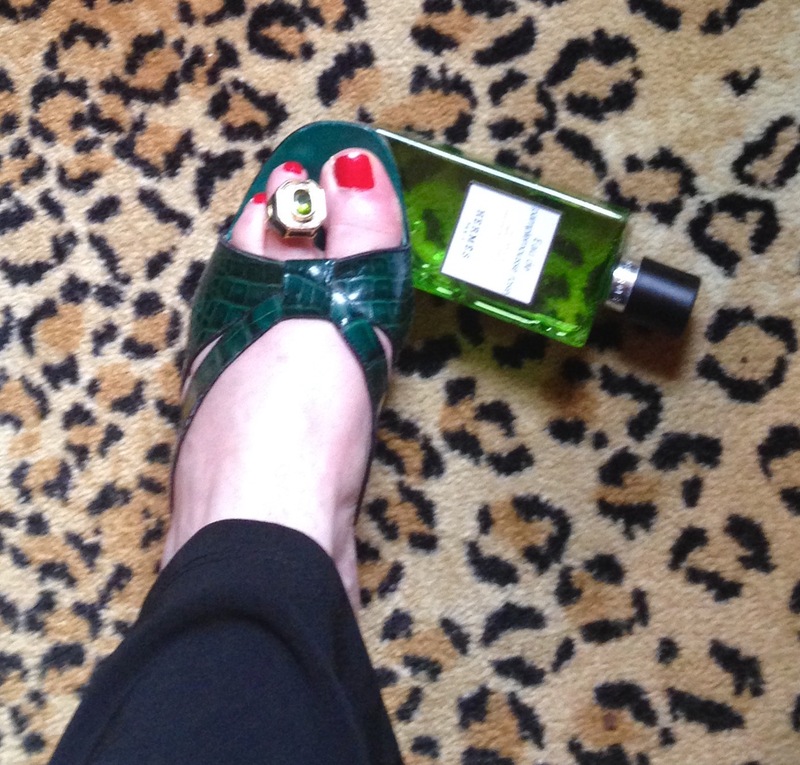 "I think I own three green items, as follows: Old pair of Manolo sandals in emerald green alligator, a black onyx and peridot ring, and lol, a bottle of Hermès bath/shower gel. That's it. I don't think there's much I can do to help. Maybe next time?" 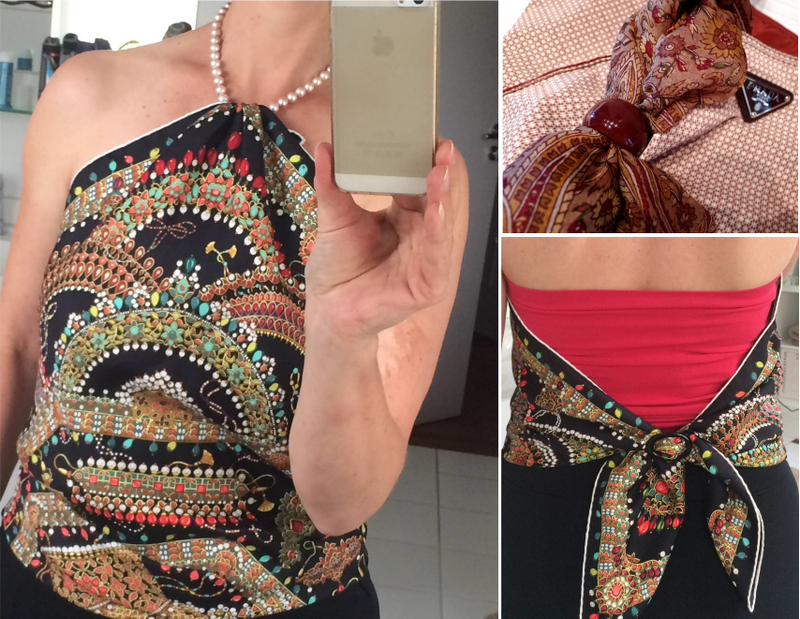 Clockwise from left: Katja with a 'Parures de Maharaja' 90 carré tied into a halter top. Ends secured in the basic slide with a Moyenne Classic scarf ring in black horn. Macs in the City with a cashmere scarf and an Anneau Infinity scarf ring in Rouge Noir. Katja as before. Still-life by happyface with with a shawl ring in sunshine honey and a Grande Classique scarf ring in dark Mother of Pearl (showing the reverse side). 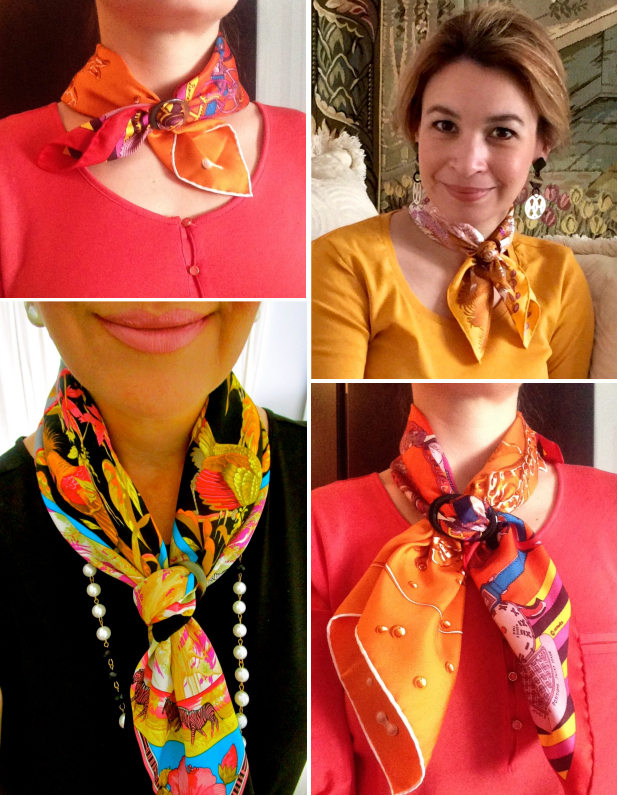 Clockwise from top left: Carol with a 'Brazil' Maxi Twilly tied in a horizontal basic slide with a shawl ring in sunshine honey. As before, with Maxi Twilly tied into a bow knot with a Grande Classique scarf ring in honey. wordlark with a 'Jardin sur le Toit' Gavroche, tied into a bracelet with a slip knot and a shawl ring ring in dark sunshine horn. Preska with a Gavroche tied into a criss-cross knot with a Petite Classique scarf ring in honey horn. East Side Pigeon with a 'Dans un Jardin Anglais' 90 carré in an asymmetrical wrap, a 'Serio Ludere' 90 carré in a criss-cross knot, the 'Dans un Jardin Anglais' in a cowboy knot, and the 'Serio Ludere' in a criss-cross bow knot. All secured with a Grande Classique scarf ring in black horn. 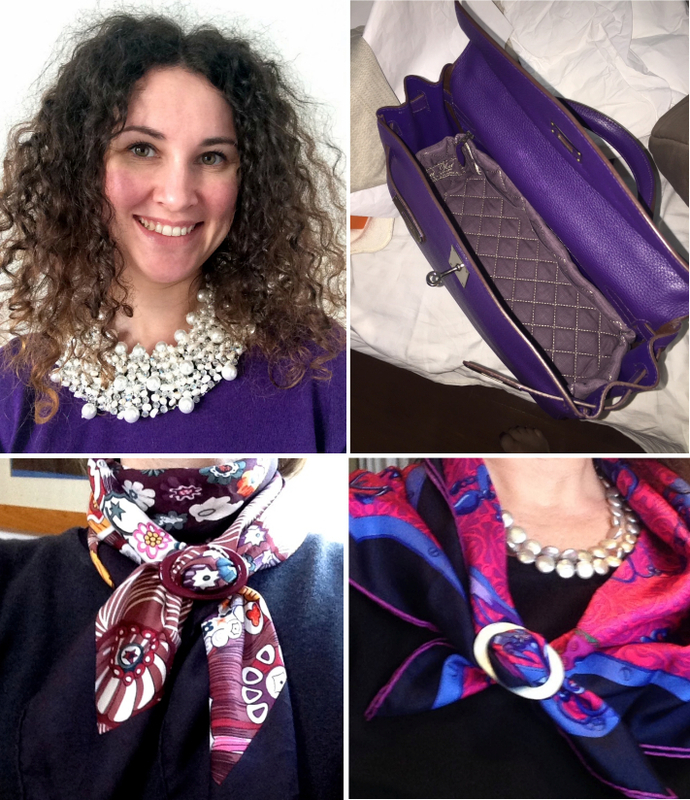 Clockwise from top left: Tamara with a Pearl statement necklac in blanc/ivoire. Still-life by Christine with a 32 Kelly in iris and a Kelly32 insert in lilac. Irma with a 90 carré tied with a Grande Classique scarf ring in dark Mother of Pearl (showing the reverse side) into an asymmetrical wrap. Blighty with a 'Sulfures et Presses-Papiers' 90 carré tied into the basic slide with a lacquered Grande Classique scarf ring in bordeaux. Still-life by Cecilia, with a 'De la Mer au Ciel' cashmere GM and a selection of lacquered scarf and shawl rings (from left to right): shawl ring in Ivoire, Anneau Infinity scarf rings in Ivoire, Taupe, Rouge Jaipur and Rouge Noir. Johanna with a long gemstone necklace in vieux d'or. Johanna's large Valentino tote with a Birkin 35 insert in noir/naturel. 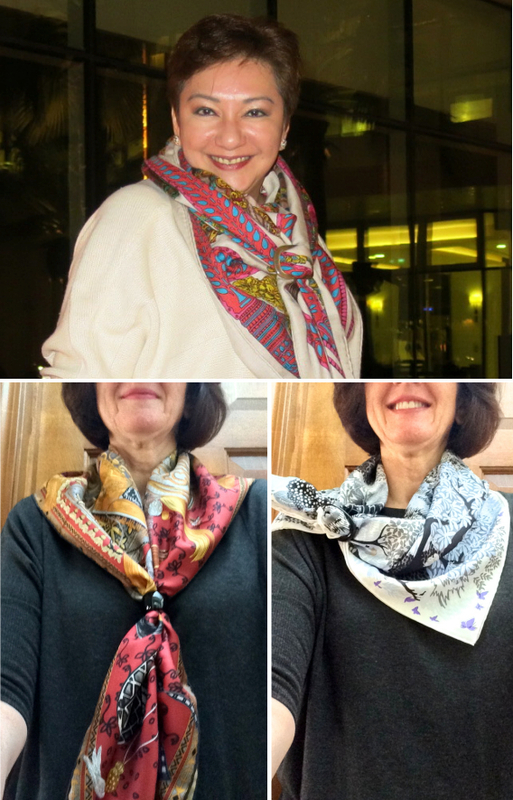 Clockwise from top left: Preska with a Gavroche Duo 'Monsieur Montre' and 'Vif Argent', secured with a Classique Petite horn scarf ring in honey in a criss-cross knot. 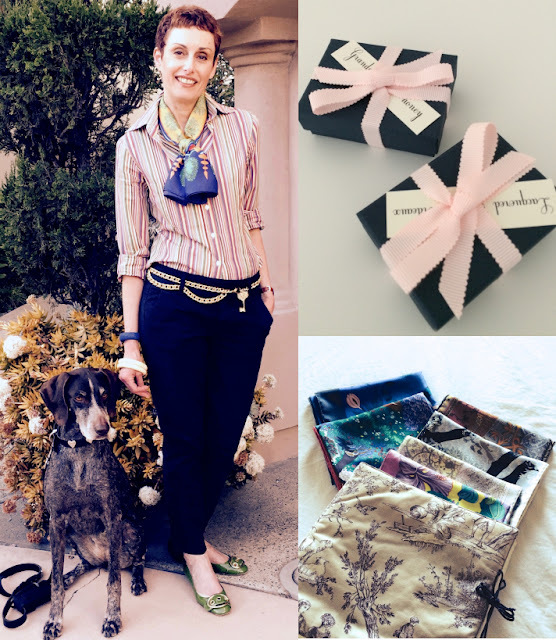 Perla with a 'Mystiques Phoenix' Gavroche, tied in a criss-cross knot with a lacquered Classique Petite scarf ring in bordeaux. Faux Fuchsia with a 'Tropiques' 70 carré in a criss-cross knot, tied with a Classique Moyenne scarf ring in honey horn. 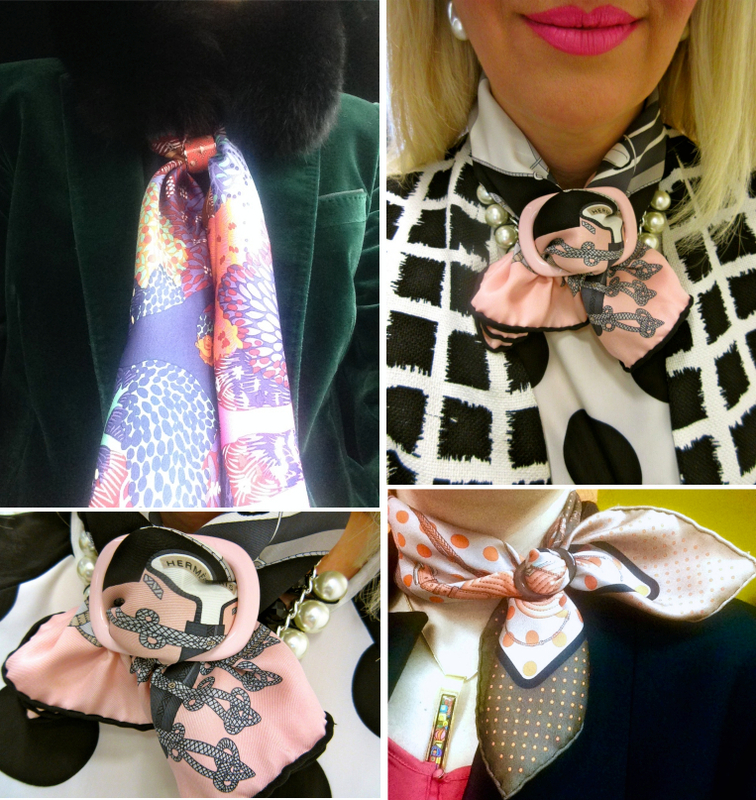 Clockwise from top left:Preska with a 'Dans un Jardins Anglais' 90 carré and a SAGA fox fur collar in black, Faux Fuchsia with a 'Circus' 70 carré, in a rectangular pleated knot, secured with a lacquered shawl ring in vieux rose, Preska with a 'Clic-clac à Pois' Gavroche. Faux Fuchsia as before. 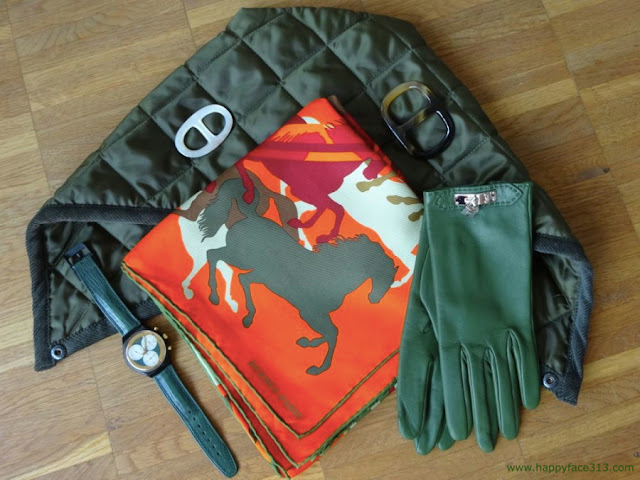 Clockwise from top: Johanna with a 'La Danse du Cheval Marvari' cashmere GM in a cowboy knot, ends secured with a shawl ring it transluscent horn in a basic slide. 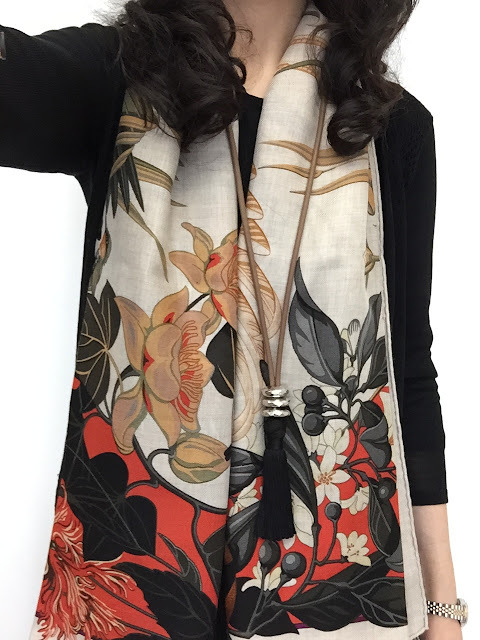 Annie with a 'Dans un Jardin Anglais' 90 carré in an asymmetrical wrap, ends secured with a Grande Classique scarf ring in black horn in the basic slide. Annie with a 'Cavalier du Caucase' 90 carré in slip knot with an Anneau Infinity scarf ring in black horn. Anyone who would like to participate in collage #16, please send your picture(s) and a short note with which name/ID/nick-name you would like to be credited with to: maitaicollection@orange.fr Looking forward to your contributions! 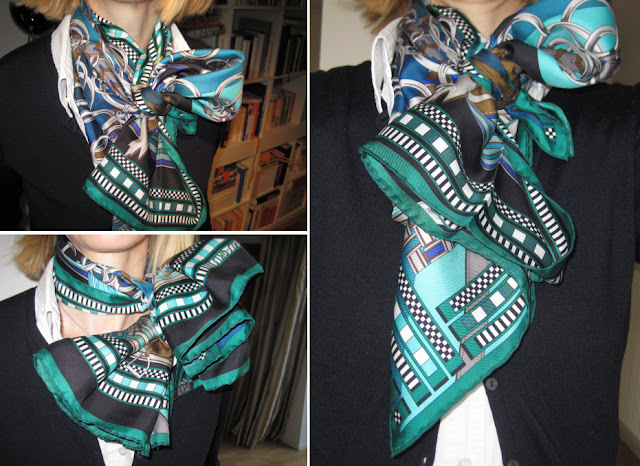 This is how Katja did it: Fold your scarf into a triangle, and secure the top of the triangle with a small knot to a necklace. Then bring the two long ends behind your back, and tie them with a Classique scarf ring into the basic slide. Good luck! Very happy you liked it, Sang:) My suggestion for all ladies in hot places - and for the 5-10 really warm days here. Still a little scary for my to see my own pictures online....but I'm in good company, that makes it easier - and I love all those creative ideas, most of all, the green toe ring :) Dear MaiTai, lovely to know that your collection has fans all around the globe - what a success! Though I had to place a fast order, in panic summer will come and I won't have sufficient supplies. You really deserve a long break but you will be dearly missed. This collage was the best yet, dear MaiTai - a feast for the senses! So many still-lifes and I love them all. Jerrine's "honorary contribution" made me laugh! Love those Manolos, Jerrine! I don't even know where to start praising the lovely ladies and gent who modeled their H and their MT with such panache. I've got scarf envy for Carole's 'Au Coeur de la Vie' in my favorite colorway. Thank you, MaiTai and all of your models. You could totally do a runway show. I'm laughing, too, Fifi, as I had no idea those toes would be published! I also agree with you . . . everyone looks wonderful and very glamorous (except my toes). I'm envious of Carol's great, very flattering haircut . . . and her scarf, too, of course. Well, I'm on drugs (or should be), I meant that I am envious of Annie's 'Dans un Jardin Anglais' in my favorite colorway. Yeesh. And Carole's haircut is super-cute! My alleged mind has obviously wandered off somewhere. I will try to get on the ball for collage #16. My confidence took a hit last year as some of you know. It's taken a lot of practice to look in the mirror and not say, yuck, who's ever going to want YOU?But really, who could look bad in that fabulous new stole or indeed, any of MT's gorgeous necklaces? #16, here I come! Dearest Fifi, Sending a heartfelt hug of encouragement and confidence your way. Not just to 'vogue' it up for the next collage, but more importantly for everyday life and to encourage you to throw away that mirror you have been looking in! 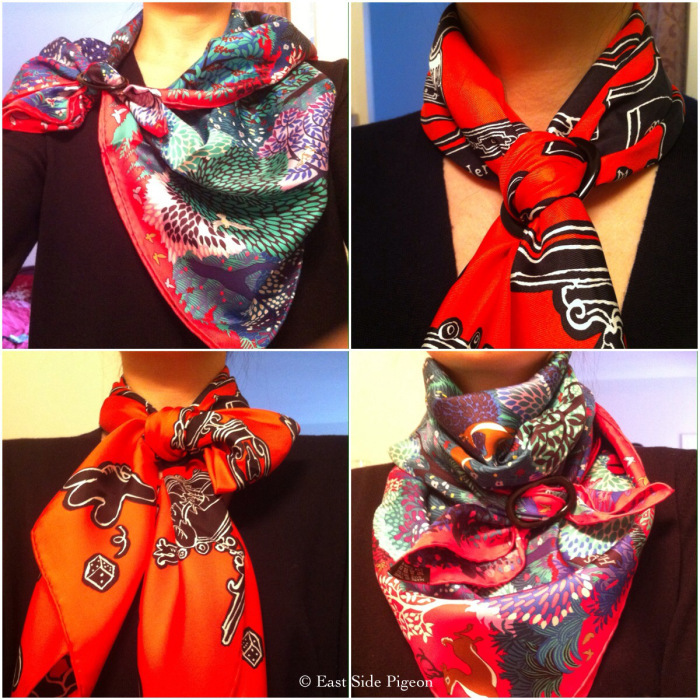 Trudye, thank you and I love the idea of "vogue-ing it up" for everyday life. I will lift a glass of anything, anytime to toast the MT sisterhood! We've never met, but I feel your warmth and kindness coming right through cyberspace. Fifi, that darn mirror is obviously defective. We all know you for the beautiful, witty, kind, intelligent and spectacular woman you are. A mirror might lie to you or distort the truth. Your salon swan sisters never will! Thank you, dear Jerrine. If I ever win the bazillions, we are all going to get together and party in the city of our choice! Thank you so very much,dear Fifs! That is the exact intent, which sometimes get lost across the www.! Thank you, dear Manuela! How kind you are. I hope your weekend is wonderful, too -- and I feel those positive vibes - zap! Could you also send cool air? It is soooo HOT in Seattle right now. 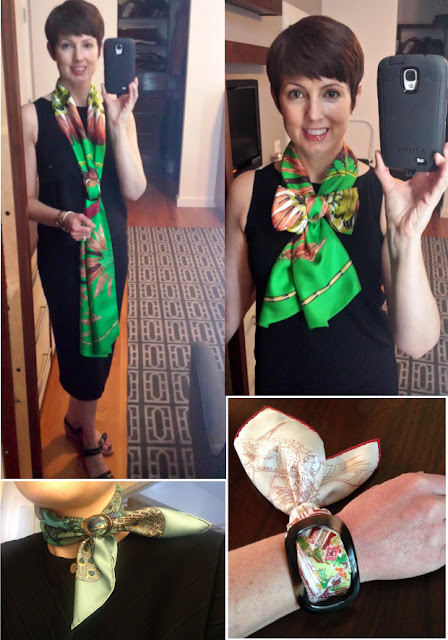 Thanks so much for including me- so many inspirational ideas- I love the shawl ring as a bangle on the wrist and the top- so fun! Nothing like some real life ladies looking wonderful to make you want to lift your game and make a bit more effort. I know there are going to be lots of entertaining comments to read here too. 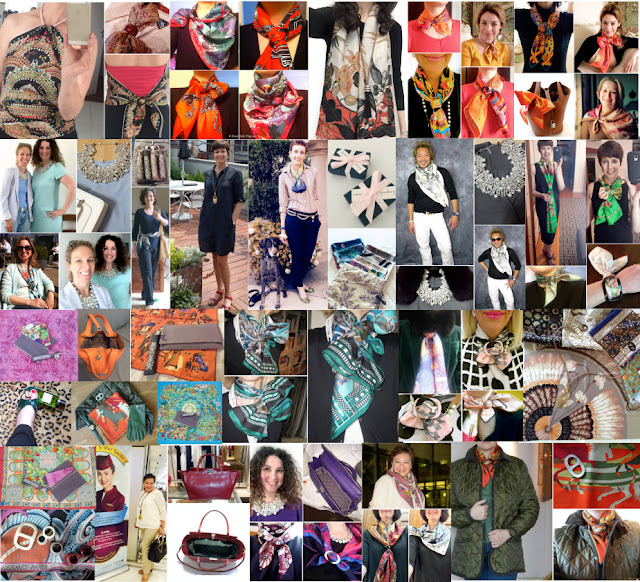 Such a beautiful collage with original pictures of your ladies and gentleman wearing your accessories with taste. Bravo to all the Salon participating of this so lively collage. Dear Mai Tai you have such a talentuous way for assembling these wonderful photos. I have a question for Cecilia. Please describe the colours in your lovely FP GM. I bought the 90cm twill in much the same cw, but returned it, because the pale green background doesn't go with anything I own. I love the neutral colours of the GM with the pop of red. Stunning !! Just as I think I have seen my favorite collage, along comes another to steal my heart! Thank you all for your beautiful and inspirational photos and thank you for the assembly darling MT! Love it all! P. S. Have to share with you all...the stoles are amazing! I ordered the taupe. The color and texture both surpass my expectations! Beautiful, deep rich taupe and light as a feather in texture! This is a beautiful addition to the MT Collection and my closet! Sorry to post around the collage, but not sure where to post? Oh, yes, THE STOLE. Mine arrived in time to welcome me back from my trip (thank God there was something welcoming in the mailbox, as I certainly didn't want to come back.) It's just gorgeous. I agree with Trudye 100% and even more if possible. I think this is the loveliest piece you've offered to date, MT. It's so elegant, and I so look forward to being able to wear it. But with the heat index at 105 today, I can only admire it sitting here on my desk. Gosh, it's pretty. Another reason to look forward to fall! Keep the colors coming, MT. I want more! I third the motion - more colors! I received my gray ombre yesterday and it's just lovely. Thanks, dear MT, for including extra sequins for those inevitable losses. The stole is truly light enough to wear in all but the hottest weather. Loving it! May I pile on and be the 4th?? I'm with Fifi, Jerrine and Trudye all the way! Love the ombre (I'm a Fifi twin! ), love the fabric, love the extra sequins that are sewn so expertly!! 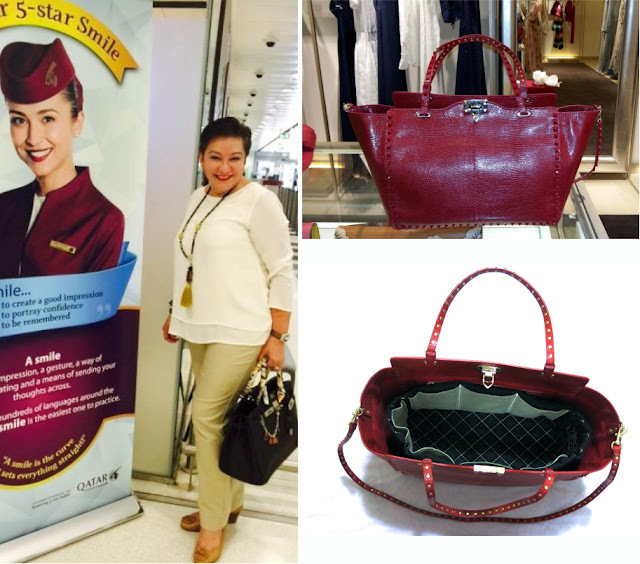 Thank you for this elegant piece! Thanks also to all contributors above...I am inspired by all of the creativity (esp. bracelet wrap!!) This collection is eye candy to last a while....yum! You all need to move to Scotland no heat problems here! Not if I beat you to that last plane seat first, Fifi. Badinage, I hope you have a very large Scottish castle. We're all on our way! Jerrine, you competitive little kitty! I do believe you'd take the very last seat from poor pitiful me and make me ride on the wing (which I would do, just to stay in a Scottish castle). See how these things get started, Badinage? Now you've got a castle. And we're all coming to stay in it! Please lay in some haggis and some lovely bagpipers in full regalia. Just let us know when you have it ready and we are booking our flights! Oh,Fifi, didn't you say awhile back that you can play the bagpipes? So, we now have that covered! Oh this is so funny, trust me, castles are the pits, they are freezing and always smell damp and musty, I have slept with a hankie over my nose at my friend's before, you want central heating here, I will happily squeeze everyone in! Okay, Fifi, we'll flip a coin for that last plane seat. And, Badinage, actually freezing damp and musty sound like a dream at this point. The south is damp and musty too, but hotter than Hades. 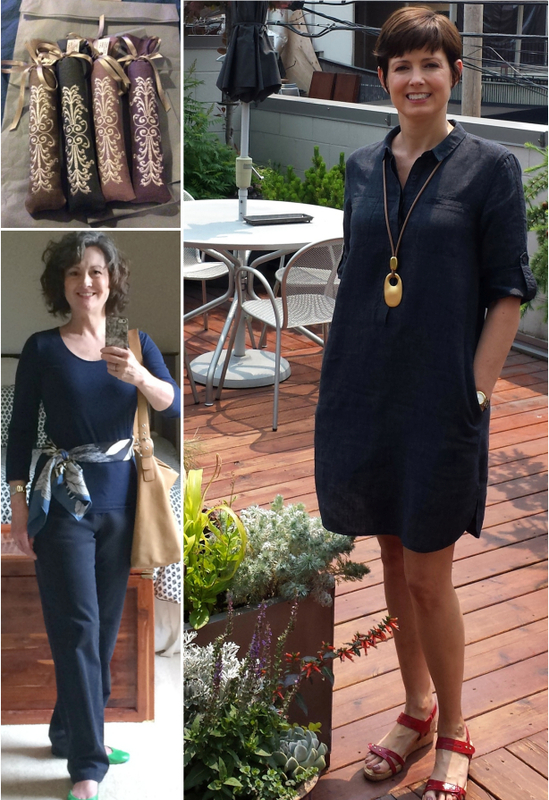 Such talented and stylish readers, I love perusing the collages that you put together; off to delve deeper. Mai Tai, will you be offering a natural coloured 32 Kelly insert? Oh, if not, which is lighter, gris or taupe? Thank you for including me once again in this lovely collage. It is so nice and so inspiring to see all the ladies and gentleman using your beautiful pieces. I am so pleased to be part of your very nice collages, thank you! Your rings bring so much creativity and style to the Carrés. 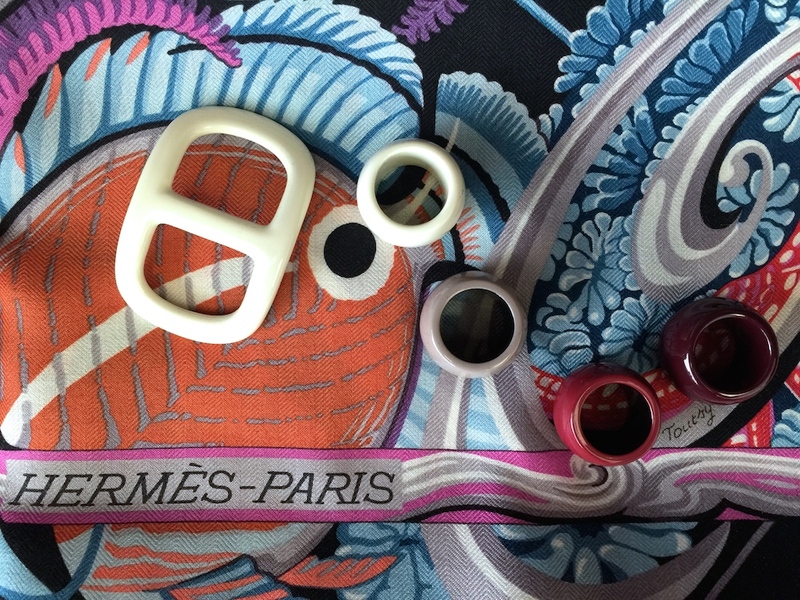 Cannot wait to try shawls with your rings of course! :-) I just LOVE this collages - it is so much fun to see what all the lovely ladies come up with! The "bracelet" with the shawl ring is something I'll definitely try! Dear Mai Tai, sorry to hog this thread, I just ordered using hubs' card (!) so not my usual surname, could I please have the lightest insert between the gris or taupe for a 32 inch Kelly? thanks so much, Tabitha. Blighty, how are you? Can I lure you and Mai Tai onto Instagram? Thanks again for featuring me at your collage #15. I truly appreciate it. I will be taking more pics soon. I have gotten a few more this summer that I need to snap a few photos with your AMAZING MaiTai Collection accessories..The H Fall2015 collection is supposed to be fantastic...I already have an eye for them. After exploring a number of the blog articles on your website, I seriously appreciate your technique of blogging.